When it comes to your image – particularly in business branding – there are a number of things to consider. From your logo design and website to your team members and business values, building a brand takes time. And while you might think you have your branding all figured out, what about the things you’re overlooking? From adding character to building brand recognition, your choice of font plays a crucial role in your business – but many companies fail to recognise the importance of choosing the right typeface. Colour and size count when it comes to mapping out your brand – and in today’s post, we’re taking a look at ways to make sure your voice is heard when it comes to finding the font that’s your perfect fit. The good, the bad and the Comic Sans! While Arial and Times New Roman can be found in CVs and academic essays, Comic Sans is synonymous with teenagers and their after-school MSN rituals. If we were to swap the two, this would change the dynamic of the platform on which it was being used. If Comic Sans is the cringe heard around the world and Helvetica means you’re artsy, what are these fonts saying about your business? You might be comfortable with fonts reflecting your personalities, but do you want your business portrayed in the same light? Of course, while script fonts might work for one brand, another might be searching for a bolder Serif. A rock band is unlikely to be found using the same font style as an accountancy firm – as the two have very different goals and values, and are targeting unique audiences. Fonts offer a chance to be creative and an opportunity to help your business branding stand out from the crowd. As technology continues to advance, its worldwide accessibility has also become much more apparent. Gone are the days when Photoshop or Illustrator was only used by leading graphic design agencies. They’re now as likely to be found on a home computer as Microsoft Word or PowerPoint. If you’re looking to create your own brand, these tools are a crucial part of your design ammunition. But why do I need these programs if I already own PowerPoint and Paint? Neither PowerPoint, Word, Paint or similar programs were created to be used as a design software. With computers playing an integral role in day to day life, we’ve all come to understand fonts by typing out the letters on our keyboard and seeing the characters appear on-screen. You press ‘A’ on your keyboard and A appears – simple, right? However, long gone are the days when fonts only included a range of 256 characters. Most modern fonts are now designed to offer customers a wide selection of choice and variety, by including variations of each character design. To illustrate my point, we have created our very own brand called “Beautiful” (shown in figure 1.1 below). The logo was created by very simply purchasing a script font we liked online and typing out the word “Beautiful”. While the typeface is elegant and well-designed, we felt it was too plain for our new brand. This allowed us to easily interchange the B and L characters we had in place, for a more adventurous finish. See the difference shown in figure 1.3 below. This feature isn’t available on standard programs such as Word, PowerPoint and Paint. Our new brand logo was starting to look appealing, but we still weren’t quite happy with its finish just yet. We wanted to include a small graphic of a butterfly. We decided to purchase a small vector illustration of a butterfly. Vector art is not only scalable to any size without loss of quality but is totally editable. We were able to fully edit the graphics colours to match our branding, enlarge the wings and increase the strength of the graphics borders, to make it stand out more. All from Adobe Illustrator. 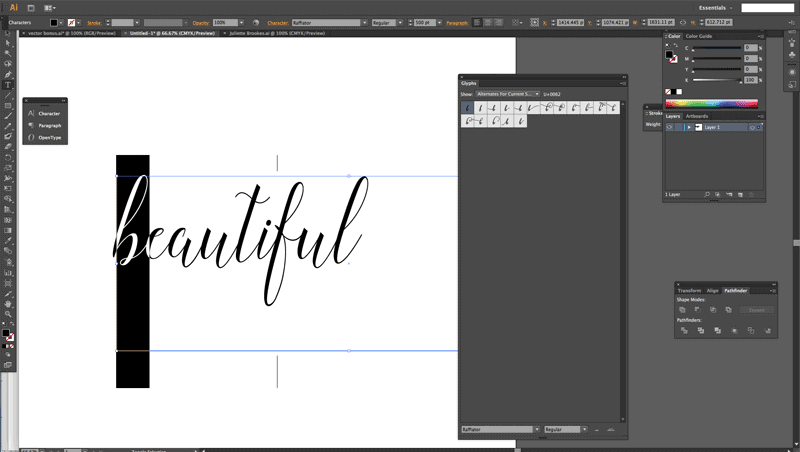 For our hair and nail salon “Beautiful”, this font was perfect – but for many other types of businesses, it wouldn’t be. It’s best practice to shop around and try out a range of fonts until you find the one that fits you best. Don’t be afraid to say if something isn’t working for you. Once you have your brand’s aesthetic appeal pinned down, you can focus on growing your client base. And with top quality fonts available for purchase via a range of marketplaces – often for as little as $10 – you can ensure your business is on the path to success. From simple styles to more complex characters, there’s a world of options available when it comes to choosing the best font for your business. And with design resources adding more options to their arsenal, you can bring your business one step closer to bespoke branding. Whether you’re an artist or an agency, business branding is about targeting the senses – with your words doing more than just conveying a written message. A powerful font can evoke feelings and encourage brand loyalty, and this is most effective when your audience respect and belief in your brand. Whether you’re bringing visitors to your blog, promoting online products or trying to establish your brand as an industry-relevant source of information, your choice of font will be one of the first things they see. If the government started publishing online reports in size 60 Papyrus, it wouldn’t be long before the spotlight was thrown on the validity of their resources – because, whether we realise it or not, fonts matter. When it comes to daring to be different, Coca-Cola has never been afraid to stand out from the crowd. From its attention-commanding promotional trucks to the ‘share a coke’ campaign, the fizzy drinks manufacturer knows the importance of keeping its brand current – while also maintaining instant recognition. Famous around the world, the brand is recognisable by its iconic red logo, but Coca Cola’s font colour is white – and its instantly recognisable style is what makes it stand out. Usually seen on coke bottles or cans, it’s easy to associate the Loki Cola font with the brand, but the true test of brand recognition is when a logo pops up in a place we wouldn’t expect – and we still associate it with that brand. No matter the size of your business, this is the sort of reach you should be aiming for when it comes to building your business branding. If a visual appeal isn’t your forte and you rely heavily on your designer for creative input, get them on board when it comes to discussing suitable font styles. Whether you decide alone or discuss your options with your team, be clear on how you want your brand to be represented and be open to artistic insight from your designer. From readability to credibility, your font says more about your brand than you might think – and pouring time into its foundations will help you reap the rewards later. So how do you go about picking the best font for your brand? 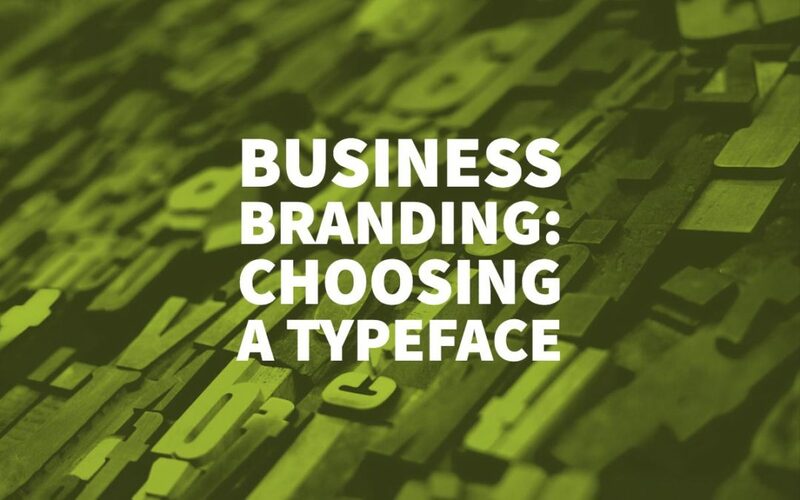 Whether it’s printed materials or website content, choosing a font for your identity is crucial when it comes to creating cohesive business branding across all of your platforms. Finding the most suitable typeface will bring character and personality to your business – helping you establish, nurture and grow your audience. Investing time – and money – in your brand’s aesthetics can be crucial to your business. From evoking emotions to encouraging repeat custom, harnessing the power of your brand’s image will help your business go from strength to strength. So common thing and yet nobody pays attention towards such small details. I guess in the end, these are the details which actually make your brand recognizable in the market.